Every nuclear power station converts uranium fuel rods through nuclear fission into highly radioactive nuclear waste. Nuclear waste constitutes a life-threatening hazard because of its radioactive emissions. People, animals and plants need to therefore be shielded from it for several hundreds of thousands of years. Nuclear power stations have been in operation for some 50 years but to date no one knows how nuclear waste can ultimately be stored. Worldwide there is not one safe and secure disposal option for the highly radioactive waste produced by nuclear power stations In the short period of time that nuclear power has been used, it is leaving behind - in the shape of the resultant nuclear waste - a dead hand of historical dimensions for the Earth. 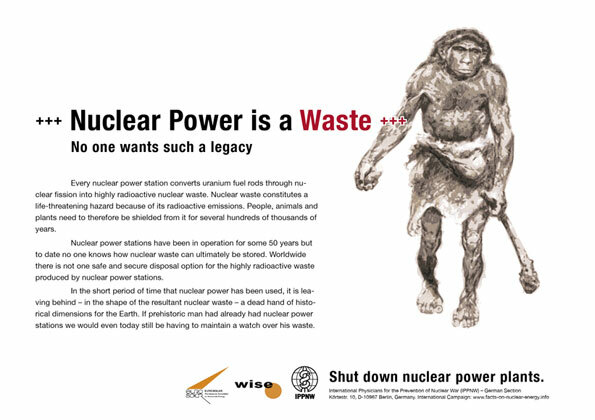 If prehistoric man had already had nuclear power stations we would even today still be having to maintain a watch over his waste. Shut down nuclear power plants.